Early in August we partnered with The Historic Trust by providing Make Art! workshops for the Trust’s innovative “Common Ground” week of history, art, music, dance, and literary events. Billed as a “gathering for curious people,” Common Ground was the perfect opportunity to invite the community to join in art workshops involving a variety of art-making techniques and mediums. More than learning a new skill, we wanted participants to benefit from a collaborative process where people join together and learn from each other, regardless of their level of experience. As registrations rolled in, we quickly confirmed what we have learned from the community — the interest is there and the need for some kind of local art center continues to go unanswered. Each day of the one-week chautauqua brought a new art form and an enthusiastic new group ready to explore and share. A portable monotype press allowed the Providence Academy ballroom to be converted into a printmaking studio, and in subsequent days, a crochet and felting studio. Meanwhile, a room in the Artillery Barracks building was turned into a figure drawing studio. The week closed out with the ballroom transformed to a performance space for Washington Dance Creative in the morning with dancers Autumn Cassity, Amara Malcom, Josh Murry-Hawkins, Cait Powers, and pianist Liz Kohland, and in the afternoon for the duo of Jackie Genis and Russell Capps. Looking back to last year’s Arts and Culture Summit, we recall a recommendation from one of our panelists. Dance and public installation artist Linda K. Johnson suggested we create “liquid infrastructure” on the path to physical infrastructure. If you don’t have permanent space, you can begin to see results by taking the lead to just make something happen. Thanks to The Historic Trust, our wonderful workshop facilitators, and dance troupes. Thanks to everyone for participating and supporting this effort. Common Ground and Make Art! workshops were definitely infiltrated by a gathering of curious people. Let’s keep the liquid infrastructure flowing on our way to a future art center. 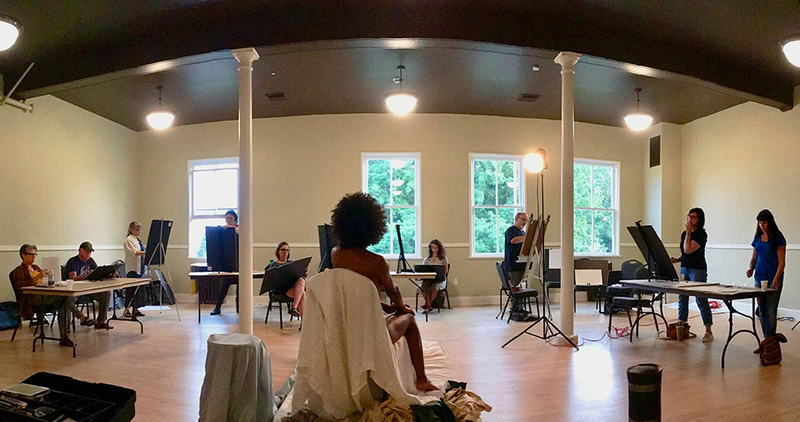 Photo credits: Alder Suttles (figure drawing photo) and Annie Davern (all other photos).